AS SHOWN As shown: Benjamin pendant rust finish large and small. Exclusively designed for Heal's, the Benjamin range is a simple geometric collection of pendants and floor lamps, available in a range of rich seasonal colours. The Benjamin pendant is sharp and modern providing the perfect silhouette for over a dining table. 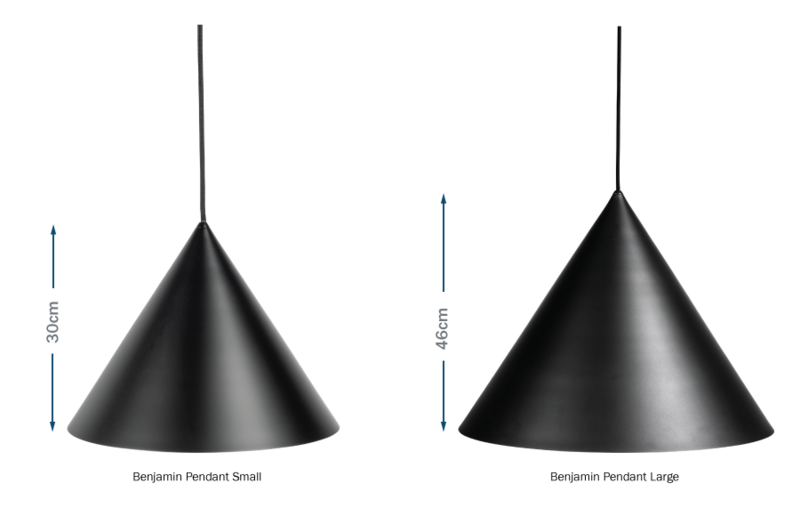 With a 2.5m fabric flex, the two pendant sizes (30cm and 46cm) can be bought in clusters and hung at varying heights to create a simple, modern statement. Simple Scandinavian design marries with an on-trend colour palette. Create a simple geometric statement through the dramatic scale of the larger pendant. The smaller sized pendants work best in bedrooms, studies and smaller living spaces. Sharp and modern design creating the perfect silhouette over a dining table. Finish: Black, grey, rust, white. Flex colour: Matches ceiling rose and shade (Black, grey, rust, white). Ceiling rose colour: Black, grey, rust, white.